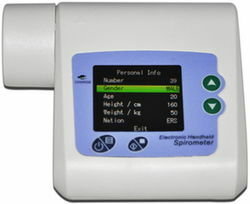 Our spirometer SP10 is an electronic pocket spirometer for homecare. The device is available in a USB and a Bluetooth version. SP10 bluetooth can be connected to the WiPaM SpiroSat android app for follow-up of patients at a distance. The results can be transmitted to the WiPaM telemedicine platform.